If you’re lazy enough, you can get things done without having to actually get things done. 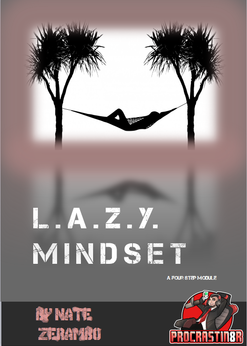 If you’ve been following my blog so far, the main focus so far has been developing the Lazy Mindset. I know what you’re thinking: Nate, when the f*ck are we going to learn actual methods on how to make money online? But look, we need to become the procrastinator mentally, become what he thinks, become how he feels; we have to embody the procrastinator’s attitude before we can do what he does in a practical sense. I could go ahead and teach you all my secrets, and you could follow the steps I outline, but you’re not going to be successful if you don’t have the proper mental attitude. You need to BE lazy. Laziness has to actually become you, not just a word you think describes you. You must be lazy and lazy must be you. You may think you’re lazy but you’re not. You need to become lazy at it’s very core. Capeesh? Last week, I talked about how laziness inspires invention and creativity; and how it brings about convenience and efficiency. Today, we’re going to focus on how being lazy can help you prioritize your daily tasks. I remember back in college I would have an important mid term paper due. I would do my laundry, clean my room, take out the trash, read a few chapters in a novel, complete prep for my radio show, go out and run a couple miles, organize my desk, and about a dozen other little chores. Yet the only progress I would make in writing my paper would be opening up Microsoft Word. It’s amazing how productive I can be while procrastinating. I was putting off something that needed to be done as soon as possible by doing other trivial tasks that needed to get done yet weren’t an immediate concern. Going back further in time a bit: In grade school, we had a reading assignment for one of my favorite books: the Hobbit. I had read the adventures of Bilbo and the dwarves probably at least half a dozen times before it was assigned to class. I love Tolkien and I love his books. I would debate about the book with my friends for fun. I collected Lord of the Rings memorabilia. I played the video games. I watched the movies. With a pocketful of other experiences and anecdotes similar to the ones I shared above, it eventually dawned on me: I hated work with DEADLINES. And I hated work that I HAD to do. Somehow, I could complete every single trivial task on my To Do list, but I didn’t even put my name on the top yet alone write the first sentence in a paper that was due in less than 24 hours. Somehow, I could write fan fiction, persuasive essays, and epic speeches about the Hobbit when it was something I wanted to do, but when I was required to do it for academic reasons, when it was EXPECTED of me to put in work about the book, I hated it. I loathed it. (I actually didn’t touch that book or any of the LOTR series for a long time. It took me years to find how much I loved it again, and let me tell you I’m glad I did pick up that book once more. See, people will call you lazy if you don’t do what you have to do, what you ought to do, what you should do, what’s expected of you. People call you lazy if you don’t meet dead lines, if you’re late, if you well, procrastinate. I say accept that as a compliment. Embrace your laziness. Be a procrastinator. If you make your own deadlines because you want to and not because you have to, you can do the most challenging of tasks (and it won’t even seem challenging because you chose to do it). I could have easily wrote a ten page paper if I wanted to, but I was too lazy to make it past six because I felt obligated to write it. Take away the obligation in what you must do and suddenly you can do a lot more than you expected. The procrastinator does what he wants and he makes his own schedule. Everything is done based on his desire and his time. His decision. He’s too lazy to do otherwise. He doesn’t waste time, resources, or energy fulfilling the desires, time, resources, or energy of other people. Because simply, he also doesn’t give a f*ck about what other people think. Mainly because he’s too lazy to care. But that’s another topic for another day that I’ll write in detail later. Eventually. I just don’t want to right now. Get your FREE copy of the L.A.Z.Y. Mindset E-book today! I'll also send you tips & tricks about online money-making and achieving the lazy way to success! DON'T MISS ANOTHER BLOG! SUBSCRIBE TO MY NEWSLETTER!